BRITISH HONDURAS P22cts $5 1939-42 CGC 67PQ "ONLY 1 EVER GRADED by ALL GRADING CO'S!" THE EARLY "KING GEORGE VIth" SERIES!!! 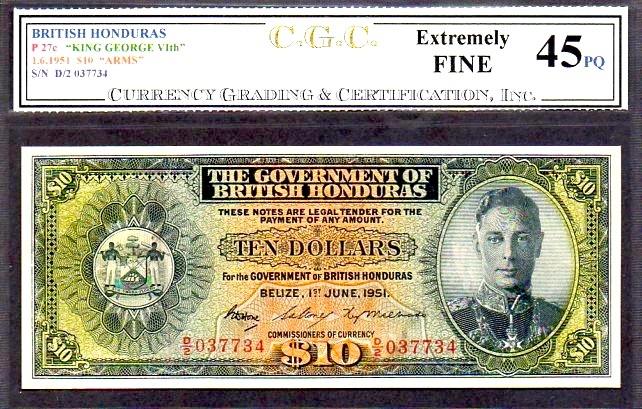 UNDER BRITISH HONDURAS, NORMALLY YOU ONLY SEE THE QEII SERIES AND EVEN THEN, NORMALLY ONLY THE $1 OR $2 AND RARELY THE $5, ALMOST NEVER THE $10 OR $20 (1950-60's SERIES) BUT TO SEE A KGVI ISSUE FROM THE 30'S IS ALMOST UNHEARD OF. AFTER SCANNING THROUGH EBAY FOR OVER 15 YEARS WE'VE ONLY SEEN ONE OR TWO, BUT WERE BOTH IN VERY VERY VERY LOW CONDITION, LIKE VG! THIS IS A VERY RARE OPPORTUNITY AND WE ARE PLEASED TO BE THE ONES TO OFFER THIS PIECE IN THE MARKETPLACE! 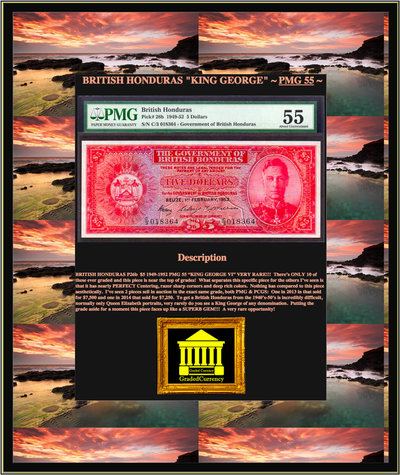 BRITISH HONDURAS P26b $5 1949-1952 PMG 55 “KING GEORGE VI” VERY RARE!!! There’s ONLY 10 of these ever graded and this piece is near the top of grades! What separates this specific piece for the others I’ve seen is that it has nearly PERFECT Centering, razor sharp corners and deep rich colors. Nothing has compared to this piece aesthetically. I’ve seen 2 pieces sell in auction in the exact same grade, both PMG & PCGS: One in 2013 in that sold for $7,500 and one in 2014 that sold for $7,250. 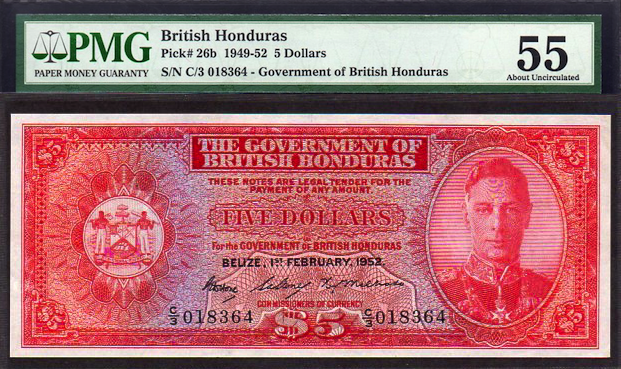 To get a British Honduras from the 1940’s-50’s is incredibly difficult, normally only Queen Elizabeth portraits, very rarely do you see a King George of any denomination. Putting the grade aside for a moment this piece faces up like a SUPERB GEM!!! A very rare opportunity! BRITISH HONDURAS P27c $10 DATED 1.6.1951 "KING GEORGE VIth" CGC 45PQ FINEST EVER GRADED BY CGC AND "ONLY 4" EVER GRADED BY ALL GRADING CO'S! THAT'S RARE! BRITISH HONDURAS COMES IN TWO MAIN VARITIES, EARLY ISSUE - KING GEORGE VIth and the LATER ISSUE - QUEEN ELIZABETH II (WHICH MOST OF US COLLECT). THIS IS LITERALLY "THE" VERY FIRST KGVIth WE'VE EVER HAD THE PLEASURE OF HANDLING (OF AN ISSUED PIECE)!!! CERTAINLY DESTINED FOR THE ADVANCED COLLECTOR THE MAN WHO WANTS WHAT MOST WILL NEVER HAVE! BRITISH HONDURAS P30c $5 DATED 1.1.1973 "QUEEN ELIZABETH II" CGC & PMG 67EPQ FINEST GRADED BY ALL GRADING CO'S! EXCELLENT MARGINS, COLORS AND CORNERS / PAPER QUALITY!!! THIS IS A VERY SOUGHT AFTER SET (BRITISH HONDURAS, LATER CHANGED TO BELIZE) AND THIS PIECE IS A SPECTACULAR EXAMPLE OF HOW BEAUTIFUL THE SET IS, AND IS A VERY RARE OPPORTUNITY TO GET A FINEST KNOWN FROM BRITISH HONDURAS!